Word of mouth is the original marketing. It was, for a LOOOOONG time, all we had. Even today, 50-91% of all purchases are influenced by word of mouth. Yet, NOBODY has an actual strategy for it. You have a digital strategy, and a content strategy, and a social strategy, and a bunch more strategies. Yet we all just take word of mouth for granted. 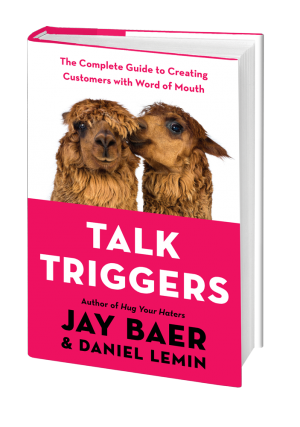 That inequity, between the importance of word of mouth and the scant attention we pay to it, is why Daniel Lemin and I wrote Talk Triggers: The Complete Guide to Creating Customers With Word of Mouth. I think it’s the best thing I’ve ever made, in any format. I know it will help people. After all, the best way to grow any business is for the customers to do the growing. Turning customers into volunteer marketers is possible—and necessary—and Talk Triggers provides the reliable system for doing just that. I’ve spent the past 18 months working on this book, although I started writing about Talk Triggers here at Convince & Convert way back in 2011. Since we started on this project, I have had a total of two days off; two days where I didn’t open my laptop over the past 550 days. Is it worth it? Is it worth it to sequester yourself to do research? To lock yourself away to write? To give up nights and weekends to promote the book? I guess it depends on who you ask. I certainly know that the sacrifices made for a project like this are predominantly made by my wife, my kids, and my team. Not by me. And that’s not to say I’ve been ENTIRELY neglectful during the creation and promotion of Talk Triggers. But there’s no question that when I go into “book mode”… priorities shift. I don’t love that. It’s not for everyone, and I’m not proud of it. But rightly or wrongly, I don’t know any other way. As my Dad told me when I was just a tyke, “if you’re going to do something, you might as well do it all the way.” That’s how I feel about writing books, and especially about this one. I’m driven by the need to teach, and I very much hope that this book teaches you – and many more people – how to systematically grow your business with word of mouth. I’m blown away (as is Daniel) by the early reactions to the book. And now, with the official launch happening tomorrow (October 2) I’m excited to see what everyone else thinks. A quick reminder that the book itself includes the greatest guarantee in the history of business books. If you buy Talk Triggers (please do) and you don’t like it, let us know and we’ll buy you any other book of your choosing. No risk, no reward. Here’s the complete first chapter of Talk Triggers. I hope it will whet your appetite enough to go to TalkTriggers.com, see the amazing bonus materials we’ve made available to you, and order your own copy – or copies for your team, or book club. Do you like chicken? Do you really, really, really like chicken? Do you like chicken as much as Jimmy Buffett likes the beach? If so, The Cheesecake Factory is your perfect restaurant. Each of the chain’s 200 locations offers eighty-five different chicken dishes. Unsurprisingly, given how many chicken dishes alone it includes, the menu itself runs 5,940 words long. That is more than twelve percent of the book you are about to read. You might think that’s too long, but for The Cheesecake Factory, it’s just right. Why? Because the vastness of the restaurant’s menu is so unusual that it compels conversation among its patrons. Menu breadth is their secret customer acquisition weapon—it hides in plain sight, in the hands of each and every diner. The menu at The Cheesecake Factory is a talk trigger: a built-in differentiator that creates customer conversations. Every day, consumers comment on the remarkable menu variety with a combination of bewilderment, awe, and frustration. 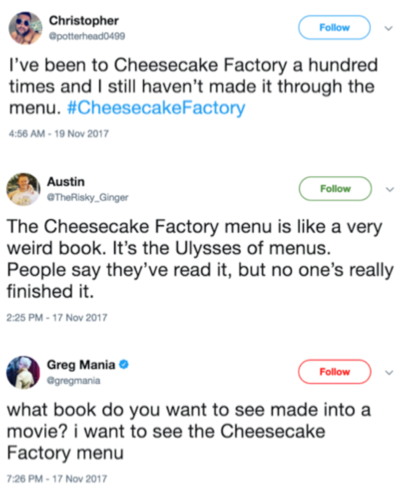 Twitter alone produced this cross-section of commentaries (and dozens more) about The Cheesecake Factory menu in early November 2017, riding along the digital winds like a smartphone-enabled messenger pigeon, spreading the word about the brand’s core differentiator to thousands and thousands and thousands of potential new customers. Like extravagant sunglasses at an Elton John concert, the menu is such an iconic part of The Cheesecake Factory experience that some customers refer to it that way. The menu’s benefit to The Cheesecake Factory’s business is massive. Financial filings for the public company show that The Cheesecake Factory spends just 0.2% of total sales on advertising. Darden Restaurants, a major competitor, operates Olive Garden, The Capital Grille, Yard House, and several other dining brands. Darden is roughly three times larger, but spends 1,799 percent more on advertising (as a percentage of sales). In real dollars, Darden spends $268 million per year more in advertising than does The Cheesecake Factory. The Cheesecake Factory doesn’t have to buy awareness because its menu is remarkable enough to compel patrons to tell their friends, which in turn creates new customers. When you commit to a talk trigger like The Cheesecake Factory menu, that difference creates conversation that clones your customers, bringing you new revenue for free. Researchers David Godes and Dina Mayzlin found that a single word of mouth conversation by a new customer leads to an almost $200 increase in restaurant sales. When that occurs over and over and over again, you end up with The Cheesecake Factory, a multi-billion dollar company that barely pays to promote itself despite operating in a category that typically requires heavy advertising. You might be wondering, “how often do customers really notice talk triggers?” And more importantly, how much do those differentiators actually get discussed? After all, an operational strength that doesn’t encourage conversation may grow repeat business from the original customer, but it does not create new customers at little to no cost. 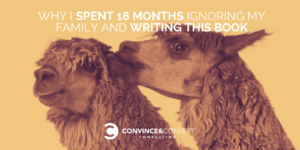 This pass-along effect, where customers tell your story almost involuntarily, turning themselves into volunteer marketers, is what makes word of mouth so delightfully impactful for companies that possess a talk trigger. To better understand the impact of The Cheesecake Factory’s talk triggers, we partnered with Audience Audit, a respected provider of consumer panels to identify hundreds of adults who had dined at a Cheesecake Factory location within the prior thirty days. Respondents were asked, “Have you ever recommended The Cheesecake Factory to someone who was not specifically asking for recommendations, just because you were particularly pleased with your experience?” Among them, sixty-six percent had. Perhaps even more impressive is our research finding that more than nine in ten customers discuss The Cheesecake Factory when directly asked for restaurant recommendations. Respondents were asked, “Have you ever suggested The Cheesecake Factory to someone who was specifically asking for a restaurant recommendation?” Nearly every patron of The Cheesecake Factory becomes an advocate when the opportunity arises. It was immediately clear that diners at The Cheesecake Factory talk about the experience. But when these customers converse, do they discuss generalities (e.g. “The Cheesecake Factory has good food”), or do they discuss specifics? The difference is important. 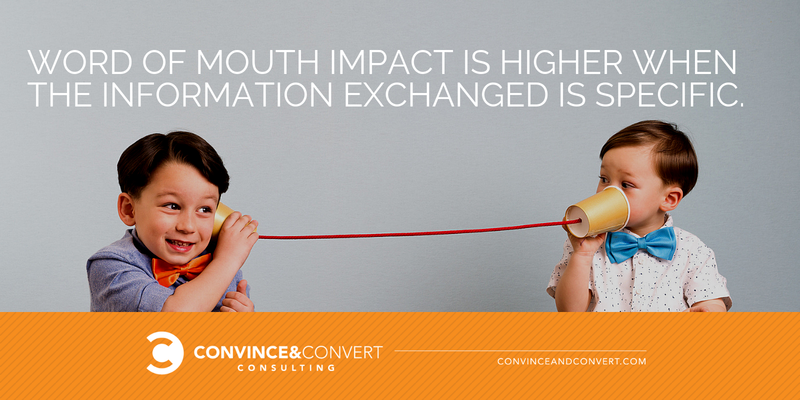 Word of mouth impact is higher when the information exchanged is specific. A consulting client of ours asked us an interesting question that you might also be wondering. She said, “What’s the difference between a talk trigger and a unique selling proposition (USP)?” A USP is well-worn marketing shorthand defined as “a factor that differentiates a product from its competitors, such as the lowest cost, the highest quality or the first-ever product of its kind. Here’s how we answered the client: “A USP is a feature, articulated with a bullet point, that is discussed in a conference room. A talk trigger is a benefit, articulated with a story, that is discussed at a cocktail party.” A USP is important, but the problem is that almost every one of them has plenty of SP, and very little U. Sure, “quality food” or “good service” are selling propositions. But they aren’t unique, and that atrophies word of mouth. Sixty percent of customers said “food quality” which we classify as general information—it’s a USP. It’s also not a particularly compelling or memorable story, since food quality is not—in and of itself—a differentiator in the category. Many restaurants offer food quality, so it doesn’t have a tremendous amount of story power. But the second-most mentioned aspect of the brand is the breadth of the menu. Nearly four in ten customers said they’ve talked about this differentiator. It’s a talk trigger! 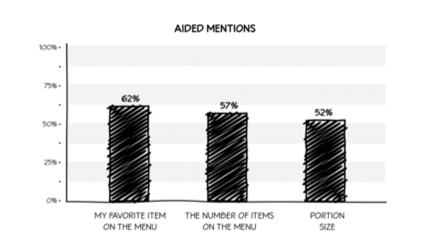 When presented with this list, more than half of all surveyed customers said they have mentioned the number of menu items to someone else, the second-most common attribute discussed. Customers of The Cheesecake Factory notice the size of the menu, and discuss the size of the menu, propelling awareness and encouraging new patrons to visit the restaurant for the first time. They have successfully turned their customers into volunteer marketers. And you can do the same. Word of mouth is perhaps the most effective—and most cost-effective–way to grow any company. Yet, we often take it for granted, like free coffee refills or another U2 album. One of the reasons we wrote this book is to solve this mystery: As consumers, we all know how impactful word of mouth recommendations are, and we have first-hand experiences with them consistently. But in our jobs, we give very little thought to making sure our products activate word of mouth recommendations. Why and how is this the case? Perhaps businesspeople don’t actually believe in the power of word of mouth? That hardly seems possible, given the available evidence. A very detailed examination of the impact of word of mouth by Engagement Labs in 2017 found that nineteen percent of all consumer purchases in the United States are directly caused by offline or online word of mouth activity. That’s approximately ten trillion dollars of economic impact. And a lot more than nineteen percent of purchases are influenced by word of mouth, even if consumers don’t fully realize or recognize it (the same way that people unwittingly hum Katy Perry songs in the shower). Word of mouth isn’t only applicable to consumer spending, either. In fact, a study by Blanc & Otus and G2Crowd discovered that the impact of recommendations and referrals in business-to-business (B2B) scenarios is actually far greater, due to the considered nature of most purchases, the high average prices, and the limited number of total customers. First, it is hyper-relevant. The recommender customizes the recommendation to fit the receiver’s perceived needs. No other form of marketing is as personalized, and consumers increasingly desire personalization. Second, positive word of mouth saves the recipient time by giving them a referral and recommendation, eliminating some or all of the research needed to make a sound decision. Third, when offered by consumers to one another, word of mouth is independent, as the talker has no financial interest in the sale of the service. This adds credibility and persuasiveness to the recommendation. This trust advantage is the key to why word of mouth is so crucial today. Fundamentally, we trust businesses and organizations less than ever, and we trust people more than ever. According to the research firm Nielsen, eighty-three percent of Americans trust recommendations from friends and family, and sixty percent trust online reviews—an important form of asynchronous word of mouth. In comparison, just fifty-two percent of citizens trust businesses globally, and in 16 of the 28 countries surveyed, fewer than half of respondents say they trust companies. Regardless of the size, shape, category, and history of your business, the reality is that half of your customers do not believe you. The author and keynote speaker David Horsager says “trust is a company’s most important asset.” He’s right, but the best distribution vehicle for that trust is not the company itself, but rather its customers. We’re in an era where trust matters more than truth, and the truth is your customers simply don’t trust you as much as they trust each other. People have the power now in ways that would have been unthinkable just a few years ago. This is why the time for talk triggers has never been better—or more necessary. Businesses’ ability to unilaterally dictate consumer attitudes and subsequent purchases and loyalties is fraying like the hem of a cheap dress. The best organizations are running ahead of this shift, purposefully crafting differentiators that get customers to tell authentic, visceral, trusted stories about the business and its products or services; stories that create new customers through referrals and recommendations. Jantsch figures that one percent or fewer of all businesses have a written plan for creating chatter. One hundred percent of businesses care about word of mouth, but less than one percent have a plan for achieving it. That’s why we wrote Talk Triggers. There are many terrific books about word of mouth and its value. Commentary from the authors of many of them is included here, and we cite their research and conclusions throughout. But what we set out to do with Talk Triggers is to provide more structure and scaffolding to give you a clear, linear, understandable, and achievable system for harnessing the extraordinary power of word of mouth. We’ve tried to create a book that doesn’t just tell you why talk triggers are so vital, but how to actually make them work, starting the day you finish reading. Based on our research and the findings of dozens of other authors and academics, mixed with our 45 years of combined experience as marketing consultants to hundreds of organizations, and dozens of Fortune 500 brands, we have developed the Talk Triggers framework for how to create word of mouth in any business. We unveil this framework here, in four sections. This first discusses the importance and economic impact of word of mouth, and examines why the overwhelming majority of organizations take a laissez faire approach to it. The second section demonstrates the four criteria that must be present for an operational differentiator to function as a consistent conversation catalyst. This is followed by the third section, which unveils the five different types of talk triggers that can be developed and optimized to turn customers into volunteer marketers. The final section includes a comprehensive, six-step process for identifying, analyzing, testing, measuring, and operationalizing talk triggers in any organization. We’ve also included a handy quick reference guide at the end of the book that summarizes key research, themes, and lessons. This reference guide was very popular with readers of our best-selling books Youtility, Hug Your Haters, and Manipurated. We hope you like it too, and find it to be a time-saver when you want to refer back to Talk Triggers after your first reading. Thanks for your support. You can get Talk Triggers risk-free here, in any format.